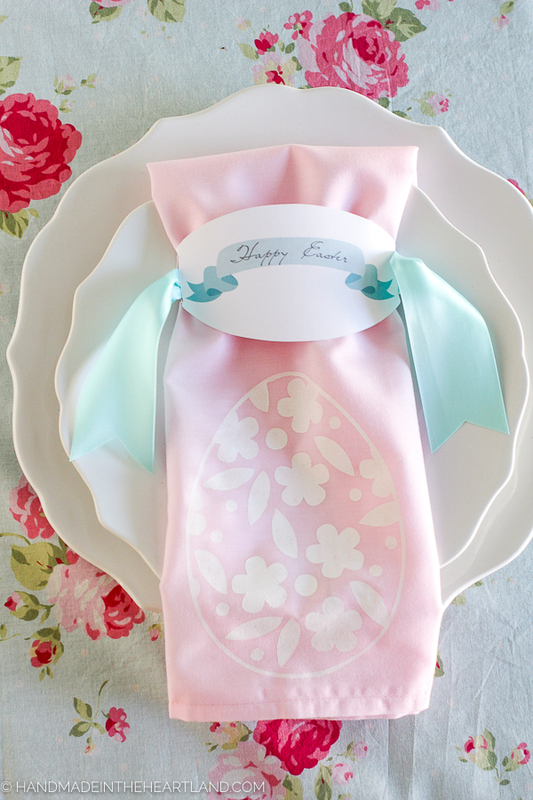 Make your Easter table a little bit more festive with custom painted napkins and a free printable paper Easter napkin ring. This post is a tutorial for how to make your very own using the Cricut Explore. This post is sponsored by Cricut, all opinions are always mine! This post contains affiliate links. 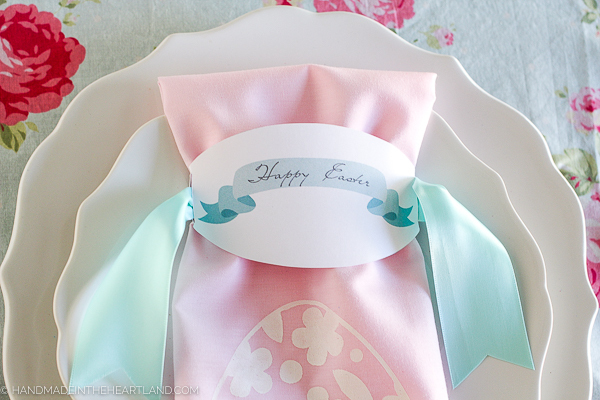 I love dressing up an Easter table and with a few quick do it yourself ideas you can customize your table in no time! 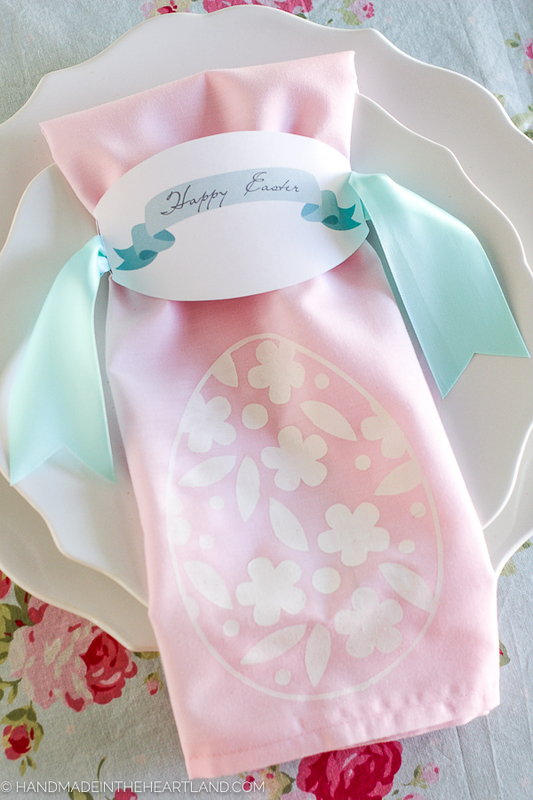 The options for painted napkins are endless, I decided to do an Easter egg in white paint on a simple pink napkin. I used my favorite crafting weapon- my Cricut Explore, I love it! If you don’t believe me check out all my other Cricut projects. I also created a free paper printable napkin ring for you. You can download it HERE. Just use an exacto knife to cut slits on the sides of the oval and insert your ribbon into them. I use this technique quite often and I love that I can make any kind of stencil I want. The stencil vinyl is so great, I love that it’s adhesive so it really helps the paint not bleed and spill over. I’ve used a lot of stencils and I hate when I accidentally move a plastic one and it ruins the project! Make sure to watch the video below to see how to cut the Easter Egg in the Cricut Design Space! 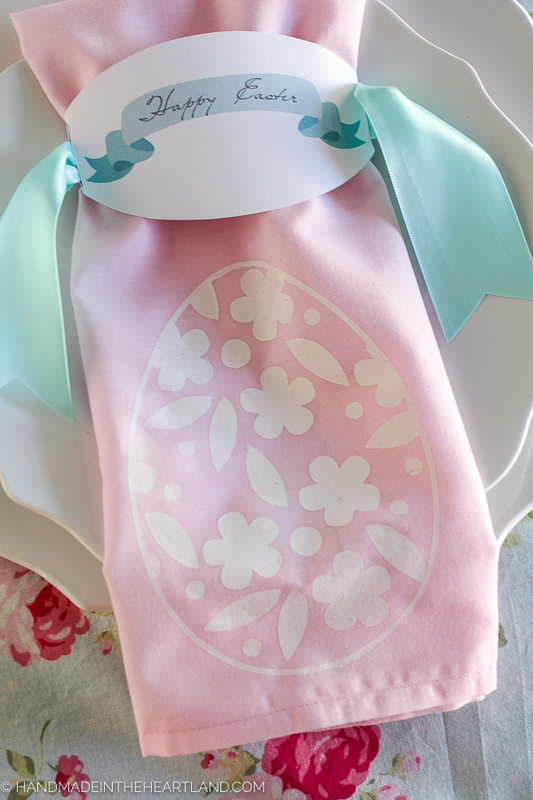 Step 1: Cut the Easter Egg on Stencil Vinyl using your Cricut Explore machine. Remove or weed the vinyl that you don’t want on your stencil– so the area that you do want to be painted. Using transfer tape or transfer vinyl move the stencil to your napkin. I centered my Egg on the bottom part of the napkin. Step 2: Paint the fabric. I like to place my fabric on cardboard, the paint will bleed through onto whatever surface you have your napkin placed. When you are painting the stencil use a foam brush and lightly dab a layer of paint on. Try not to overload the paintbrush, too much paint can lead to spilling. Let dry for an hour or so and then remove the stencil! If you make these please let me know! 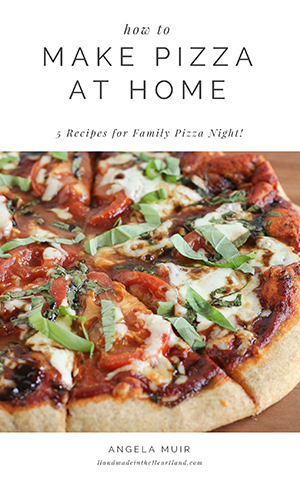 It thrills me to see you using ideas from the blog! Leave a comment or tag me on Instagram (@handmadeintheheartland) or facebook!